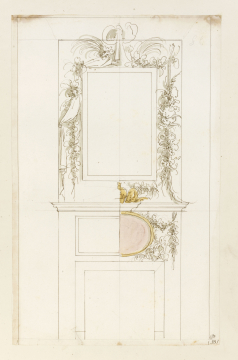 Sketch design for alternative chimney-pieces, left and right, with a tall frame in the overmantel, bordered on left with suspended drapery and foliage and on right with foliage and putti, and with alternative fire surround panels, the right one oval, shaded pink, and surmounted by a crown and putti on the mantel shelf. You are here: CollectionsOnline /  Sketch design for alternative chimney-pieces, left and right, with a tall frame in the overmantel, bordered on left with suspended drapery and foliage and on right with foliage and putti, and with alternative fire surround panels, the right one oval, shaded pink, and surmounted by a crown and putti on the mantel shelf. The design presents alternatives for pendant foliage and drapery motifs, hung from a central drapery knot above the picture frame. Characteristically, the top of this central knot reaches into the zone of the cornice. On the left side, bunches of fruit and flowers are attached to a drapery swag, which is drawn across to the right halfway down while the drop hangs vertically alongside the picture frame. On the right, foliate masses hang with two winged putti heads to a ribbon pinned to a nail in the top right-hand corner and hung across from the central knot, where fronds spray out, left and right. This drop is brought round the bottom of the frame as a swag and hangs from its centre above a crown flanked by a cherub's head. In this right half of the design an oval panel is proposed for the deep frieze above the fire surround, and to its right are further swags and whorls of foliage. The left side of the design in this zone presents a simple rectangular frame.